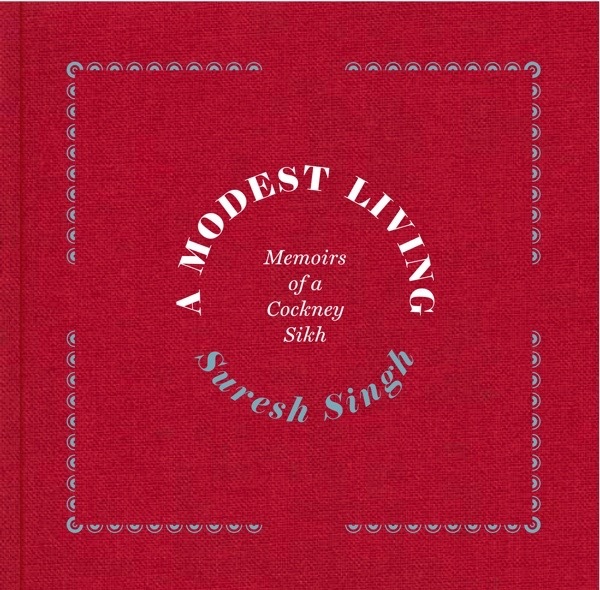 Spitalfields Life Books will be publishing A MODEST LIVING, Memoirs of Cockney Sikh by Suresh Singh on 18th October. 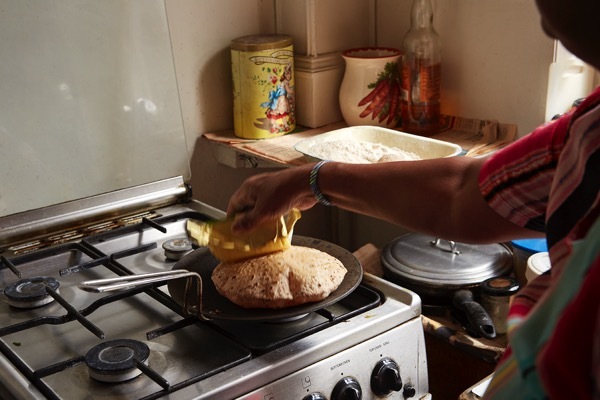 Today we present one of Jagir Kaur’s recipes from the book, as photographed Patricia Niven. These recipes have been eaten by Suresh & Jagir’s families for generations in the Punjab and they still cook them today in the East End. I was lucky enough to eat many chapatis cooked by Jagir while we were working on the book and the magic of watching them inflate like balloons never ceased to delight me. 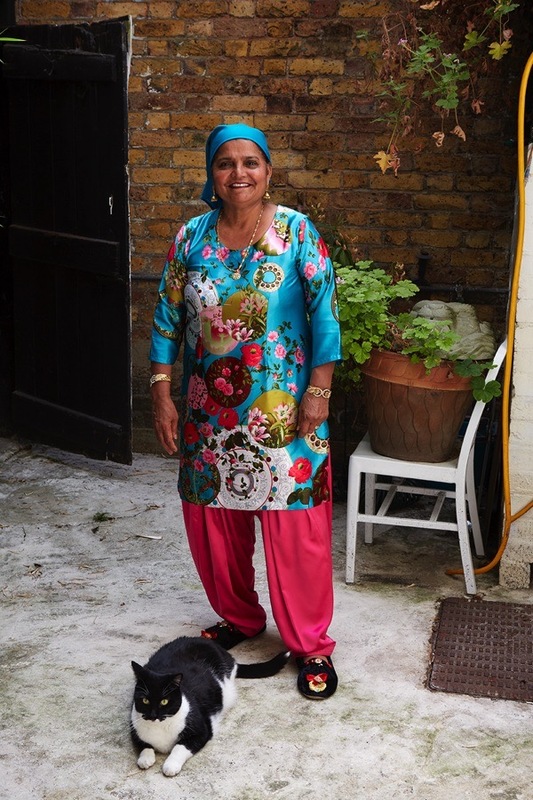 In this first London Sikh biography, Suresh tells the story of his family who have lived in their house in Princelet St for nearly seventy years, longer I believe than any other family in Spitalfields. Chapters of biography alternate with Punjabi recipes by Jagir. You can support publication by pre-ordering a signed copy now, which will be sent to you on publication. Chapatis are the grain staple of the Punjab where most of the grain harvest of India is cultivated. We always include rotis and they are part of our blessed ceremony. Knead the flour, water, and oil (if you are using it) into a smooth dough. Then let the dough rest in the fridge for at least half an hour. Flatten out the perras from the centre using your thumbs to make thick, disc-like shapes, using a rolling pin to further flatten them out. 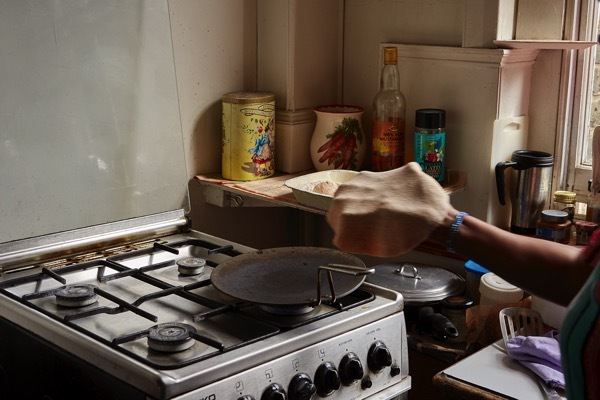 Shape the chapati by tossing it back and forth from one hand to the other, making a clapping sound. Use a tawa (flat cooking plate) to cook the chapatis. Set the tawa on a medium heat and place the flattened-out dough on the hot plate, flipping the chapati every fifteen to twenty seconds. 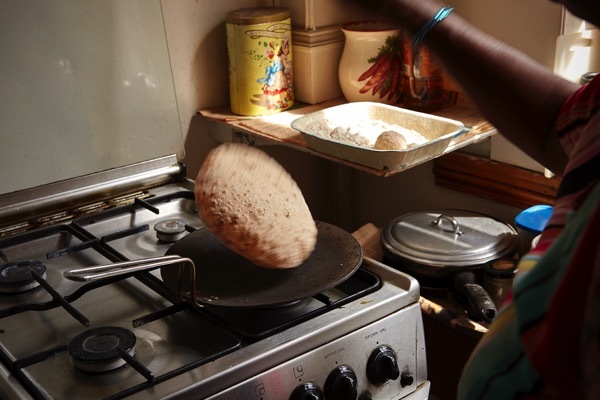 Towards the end of the cooking process, the chapati may be toasted briefly on the naked flame to puff it up like a balloon. This also helps cook it more evenly. You can dab a little butter or ghee on the finished chapatis to keep them fresh. Be careful not to get any grease on the cooking plate as this will make your kitchen very smoky. 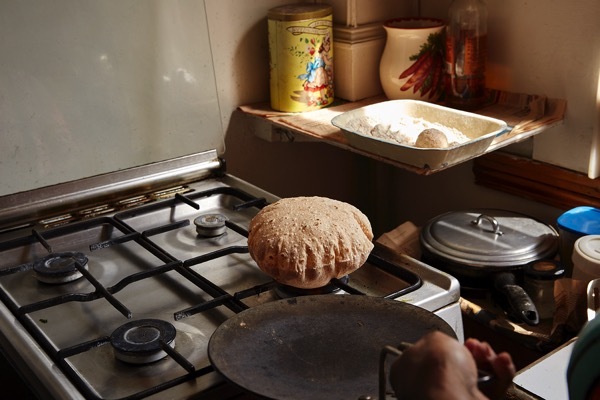 Keep the chapatis warm by wrapping them in a clean tea towel. For yellow chapatis, which are eaten with Sarson da Saag, use corn flour instead of atta (wheat) flour, and hot water instead of cold water. Mix the ingredients with a spoon until the corn flour absorbs all the liquid, making a sticky (not runny) dough. Add more water or corn flour as needed. Then knead with your hands into a ball. Divide the dough into five equal portions. Wet your hands and flatten the dough by tossing it between your hands, making a clapping sound. Place the tawa on high heat and place the flattened-out dough on the hot plate. Toast for about three minutes, turning frequently until brown on both sides and puffing up in the middle. 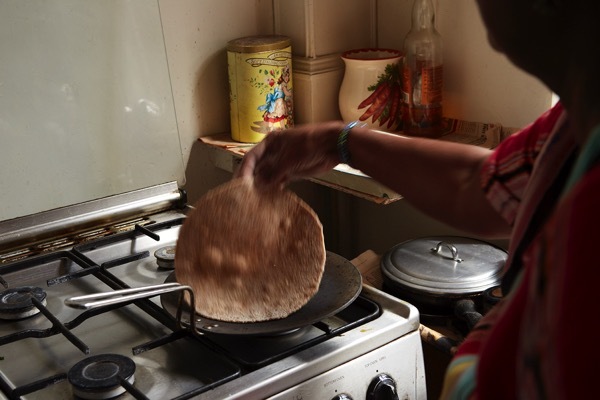 You can dab a little butter or vegetable oil on the finished chapatis to keep them fresh. Great recipe, thanks. And very great Lohri Ji. I think I’ve have to buy myself a chapati pan! Yum. I love the photo of her with her handsome tuxedo cat. Thank you for sharing your family recipes, these look amazing ! Just off to buy a tawa! I love this series. 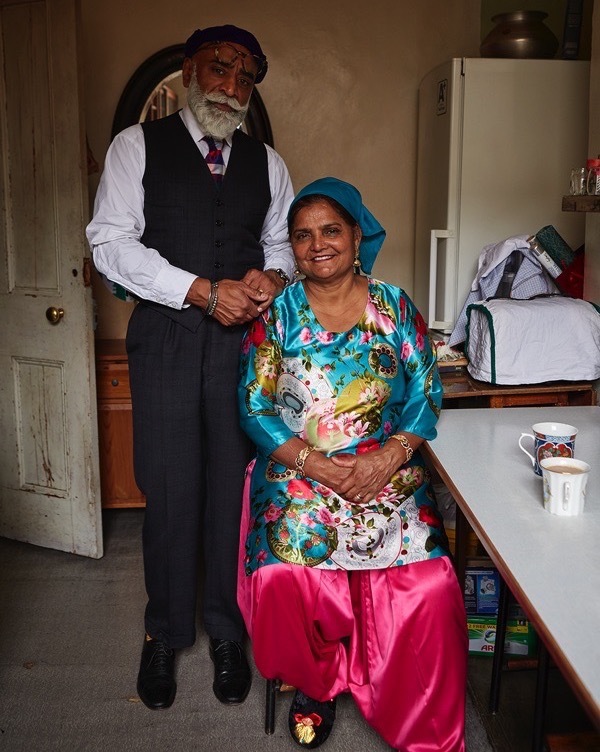 I was brought up in Smethwick and had many Sikh schoolfriends and neighbours and it is lovely to read about so many things that I recognise from that community in my childhood. Some of them had come from Uganda at the time of Idi Amins expulsion and I can only now fully realise the hardship and hard work making a life here entailed, as it also was for Joginder and Suresh and Jagir and many others. They enrich the country that they have become part of mightily. This book is on my Christmas list and I hope reaches the widest audience. Thank you GA, Suresh and Jagir. Wow – I must try this at home. I love the puffed chapatis. I also love Jagir’s top – the fabric is wonderful for the colour and pattern. Is there anywhere I could find similar fabric? Congratulations on the publication of the book. I’m sure it must be interesting reading. I’ll have to try to make the corn chapatis.